This The Eyepiece and Filter Kit contains 5 superior grade 1.25" Plossl eyepieces that deliver excellent resolution, brilliant color, maximum edge-sharpness, and enhanced clarity. Each eyepiece is fully multicoated to minimize reflections while ensuring total light throughput. Included in this comprehensive optical package the astronomer will find a very useful 2.0x Barlow lens that is capable of doubling the power of any 1.25" eyepiece. This Barlow is fully multicoated for superior optical performance. 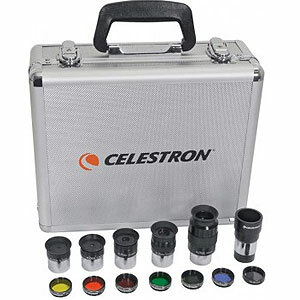 Taking the versatility of this lens kit further - Celestron has also included 7 1.25" filters; 6 colored filters along with a neutral-density moon filter. The entire set of lenses and filters fit into the custom-fit aluminum carry case for ease of transport and safe storage.